Body Muscle Massage is a formula conceived in the Canadian Rocky Mountain Range. Originally produced in small batches that catered to alpine skiers, mountaineers, and adventurers, it has evolved into a premium, clinic-quality lotion that delivers the broad therapeutic range of no less than twelve botanical extracts. It’s a unique, nongreasy massage lotion for the professional therapist that employs multiple techniques requiring a smooth glide and extended workability, without a slippery or greasy feeling, which allows for deep penetration. New Roots Herbal’s Body Muscle Massage will help reduce swelling and pain while helping with the recovery of injured or stiff limbs. It will also assist with pain relief or sports-related muscle soreness. Although a therapeutic massage alone is valuable, essential oils are effective to soothe sore muscles and ease muscle spasms. These typically manifest as chronic pain between the shoulder blades, in the neck, hips, lower back, arms, or legs which can become numb or painful. Symptoms may be caused by emotional stress, arthritis, poor posture, locked spinal joints, or a nutritional inadequacy. They’re usually accompanied by chronic spasms, along with constriction of connective tissue. 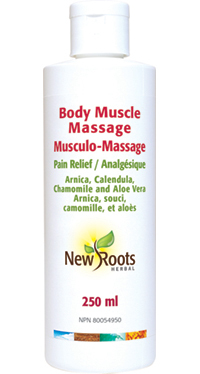 New Roots Herbal’s Body Muscle Massage is drenched with pampering almond oil; skin-smoothing emollients; and extracts of calendula, arnica, gentian, hay flower, hypericum, lemon balm, juniper, pine needle, camomile, and aloe vera. These essential oils and beneficial botanicals penetrate deeply, leaving the skin feeling soft, moisturized, and refreshed. Other ingredients: Extracts of [calendula, arnica, gentian, sweet clover, hypericum, lemon balm, juniper, pine needle, and chamomile], purified water, sweet almond oil, vegetable glyceryl stearate, stearic acid, cetyl alcohol, glycerin, aloe vera, edetate disodium, carbomer 940, trialcoholamine, cucumber extract, rosemary (Rosmarinus officinalis) leaf extract, citric acid, sodium hydroxide, and benzoic acid.